On October 21, 1945, Lt. (Jg.) 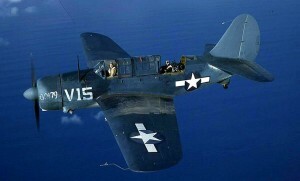 T. R. Delehunt was piloting an F6F-5N Hellcat, (Bu. No. 70915), taking part of a training exercise off Block Island when he noticed grey smoke streaming from one side of his engine. After declaring an emergency, he set a course for Quonset Point Naval Air Station. Despite the smoke, all instruments were reading normal, until he came within the area of Point Judith. At that time his oil pressure began dropping, so he was re-directed to the Charlestown Naval Auxiliary Air Field. The oil pressure continued to fall, and as he neared Charlestown Beach the engine suddenly stopped. Lt. Delehunt was forced to make an emergency landing in the water, coming down about a 1/2 mile from shore. The aircraft was a total loss, but Delehunt was not injured. On the night of October 11, 1945, Ensign J. 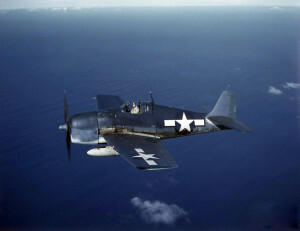 A. Guice, (USN), took off from Charlestown Naval Auxiliary Air Field piloting an F6F-5N Hellcat, (Bu. No. 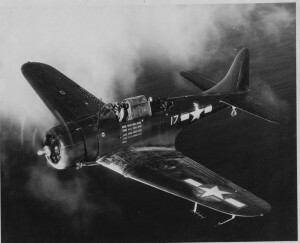 79664), for a gunnery training flight approximately 17 miles south of Block Island. The night was particularly dark and the horizon wasn’t visible, necessitating instrument flight. At the designated area, Ensign Guice and other aircraft took turns firing rockets at a target-spar that was being towed by boat and illuminated by flares. While making a run at the target from an altitude of 3,000 feet, Ensign Guice’s aircraft was observed to clear the target and enter a barrel roll to the left and strike the water. He didn’t get out of the aircraft before it sank. Source: U.S. Navy Accident Report dated October 11, 1945. On the morning of July 5, 1945, a flight of U. S. Navy F6F-5 Hellcat fighter planes took off from Westerly Air Field in Rhode Island for a “section tactics” training flight. One of the aircraft, (Bu. No. 71620), was piloted by Ensign William Warren Rehberg, of Decatur, Alabama. The other F6F, (Bu. No. 53055), was piloted by Lt. (Jg.) Wallace F. McCoy, 23, of Dallas City, Texas. At 12:03 p.m., which conducting aerial maneuvers at 6,300 feet over the Westerly area, Rehberg’s and McCoy’s aircraft were involved in amid-air collision. Both airplanes were seen to be trailing smoke as they dove toward the ground, and both crashed and burned in the Ashaway section of Hopkinton, Rhode Island, a town the borders Westerly to the north. Neither pilot survived. To see a photograph of Lt. (Jg.) McCoy, go to www.findagrave.com, Memorial #61030688. U.S. Navy Accident Report dated July 5, 1945. On September 20, 1943, Ensign Charles Frederick Leiserson, age 21, was piloting an SBD-4 Dauntless, (Bu. No. 10470), on a gunnery training mission when the aircraft crashed and burned in Westerly, R.I. Also aboard was Ensign Raymond R. Strimel, age 28. Both men were killed. Ensign Leiserson is buried in Arlington National Cemetery, and Ensign Strimel is buried in East Lawn Memorial Park in Reno, Ohio. On the night of July 13, 1944, a flight of U.S. Navy F6F Hellcats were practicing night field landings at the Charlestown Auxiliary Naval Air Field. The night was relatively dark with no moon, and low cloud overcast obstructed the horizon line. The aircraft were flying a in wide circle pattern at an altitude of only 200 feet. At approximately 11:45 p.m., two observers at the signal platform thought they heard an aircraft engine cutting-out followed by a possible crash into the water. The control tower was notified, and a roll call of the aircraft was begun. One pilot to acknowledge the roll call was Ensign George R. Rymal, piloting an F6F-3N, (Bu. No. 41478). However, just as he was replacing the microphone he struck the water. He managed to escape before the plane sank and was rescued shortly afterwards. When the roll call was completed, it was discovered that Ensign Gerald V. Brostkaux, piloting F6F-3N, (Bu. No. 42954) was missing. An oil slick was later found in the water where it was believed his plane went down. On June 17, 1943, a navy PV-1 Ventura, (Bu. No. 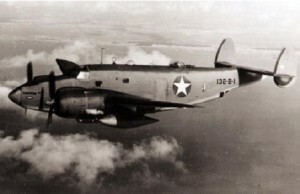 29860), with six men aboard, was making an approach to Rhode Island’s Quonset Point Naval Air Station after six hours of flying cross country. Thirty other aircraft were all in the vicinity attempting to land after being advised by the tower that the airport would be closed shortly due to the bad weather that was closing in. As the plane was about to touch down it hit an air pocket and slammed onto the tarmac, the wheels causing it to bounce back into the air. It fell again, and this time the landing gear collapsed, sending the aircraft skidding on its belly down the runway. Fortunately there was no fire and no serious injuries to those aboard. On November 3, 1945, Ensign Henry A. Clark was piloting an F6F-5 Hellcat, (Bu. No. 78639), from Floyd Bennet Naval Air Station in New York, to Squantum Naval Air Station in Massachusetts. As he was passing over Narragansett Bay the engine began cutting out resulting in loss of power and altitude. Ensign Clark made an emergency water landing about 3/4 of a mile southwest of the Quonset Point Naval Air Station in Rhode Island. The aircraft sank, but Ensign Clark escaped without injury. The aircraft was salvaged on November 6. Source: National Archives, TD451103RI, via Larry Webster, Aviation Historian, Charlestown, R.I.
On February 15, 1945, Ensign James T. Wylie, piloting an F6F-3 Hellcat, (Bu. No. 42970), was making practice landings and take-offs on Runway 22 at the Charlestown Auxiliary Naval Air Station in Charlestown, Rhode Island. (The air station was located on the shore of a large body of water known as Ninigret Pond.) After his fourth landing he took off again, and when he was about 3/4 of a mile off the end of the runway at an altitude of 200 feet, the aircraft’s engine began to sputter, and then stopped. Ensign Wylie made a successful emergency landing in the water and was able to inflate a rescue raft before the plane sank. He was rescued by a crash boat about 20 minutes later. National Archives TD450215RI, via Larry Webster, Aviation Historian, Charlestown, R.I.